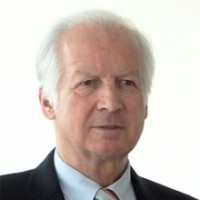 Wilfried Kurz is Professor Emeritus of Materials Science and Engineering at the Swiss Federal Institute of Technology Lausanne (Ecole Polytechnique Fédérale de Lausanne, EPFL). He holds an Engineering Diploma and a Ph.D. in metallurgy both from the University of Leoben, Austria. In 1964 he joined the staff of the Geneva Research Laboratories of Battelle Memorial Institute which he left as head of the physical metallurgy group to take up the position at EPFL (1971), Director of the Laboratory of Physical Metallurgy (1974) and of the Laser Materials Processing Centre (1985). His research is oriented to theoretical and experimental studies of microstructure development during solidification processing and solid-state transformation of materials. He was co-founder of the first Swiss curriculum in Materials Science and Engineering (1974), and twice Head of Department of Materials Science and Engineering. Under others, he was member of the Board of the Swiss National Science Foundation, of the German Society for Materials (DGM), President of the Swiss Association for Materials Science and Technology, Chairman of European Research Program COST, and President of FEMS, the Federation of European Materials Societies. He is Corresponding Member of the Austrian Academy of Sciences. He has published 4 books, 220 scientific papers and 10 patents and is Highly Cited Researcher of the Institute for Scientific Information (ISI-Thomson Reuters). International Awards: Hans Malzacher Award from ASMET (Austria), Bruce Chalmers Award from TMS (USA), Albert Sauveur Achievement Award from ASM (USA), Médaille Bastien Guillet of SF2M (France), Heyn-Denkmünze of DGM (Germany), Luigi Losana Medal of AIM (Italy), National Friendship Award (People’s Republic of China), European Materials Gold Medal of FEMS, and Honorary Member of the Iron and Steel Institute of Japan.